Tags: 2020VQ, community, Inspiration, Outreach, Randy, Support. Are you missing out on Tracy, Autumn and my trip to Scotland presently? We are delighting in our vacation at the moment, so to make amends we want to invite you to join us for an exciting opportunity. On September 14 we intend to attend the showing of the “dogumentary” “Pick of the Litter” at the Kendall Square Cinema in Cambridge, MA. It is easy to marvel and appreciate the incredible work done by all of my Guide dogs from Ostend to Quinn to Ms. Autumn. Many times I’ve been asked for more insight into just how this is all possible and now you can get a look into the process like never before. 2020 Vision Quest is proud to support Guide Dogs for the Blind, as they lent a paw to the process of this film we want to share with you. So save the date and come join us on September 14! After several years in the making, we are excited to announce that Guide Dogs for the Blind is the subject of an award-winning, feature-length documentary that is coming to theaters across the country at the end of August. 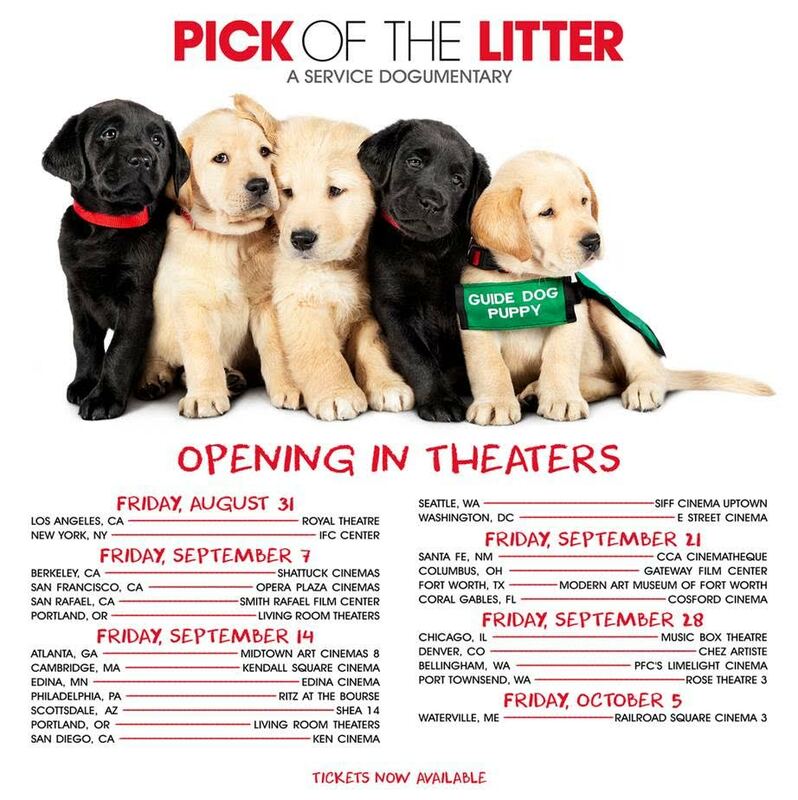 The film, titled “Pick of the Litter,” follows a litter of GDB puppies on their journey to becoming guide dogs. The filmmakers, Dana Nachman and Don Hardy, received unprecedented access to raisers, staff, and clients in order to create this look at our life-changing mission. We hope you’ll go check it out! More information and the trailer for the film can be found at guidedogs.com/pickofthelitter. Tags: Fundraising, guest blogger, Inspiration, Outreach, Peak Potential, Randy, Support. We are thrilled to announce the Bank of New Hampshire returns to be our Platinum Sponsor for the 9th Annual Peak Potential Gala! Our newest team member, Carolina Tumminelli, is on board to help your sponsorship opportunity be Peak Potential worthy. I asked Carolina to announce the great news of Bank of New Hampshire choosing to join us as the event sponsor once again while sharing a bit about her motivations for joining us. I interrupt her guest blog briefly to thank Bank of New Hampshire, Carolina, and all our potential future sponsorships for the choice to partner with the Peak potential team. I certainly love and value the work we do with 2020 Vision Quest and one of the many gifts are the interactive experiences of working with tremendous partners and teams. T.E.A.M. – Together Everyone Achieves More. Learn more about how to become a sponsor of Peak Potential. Preparations are underway for our 9th Annual Peak Potential Dinner, our largest fundraising event of the year. We are pleased and honored to announce that Bank of New Hampshire has once again agreed to be our Platinum Sponsor for the 8th year in a row! 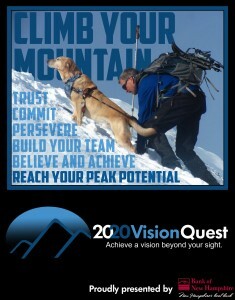 Their support of our cause, as well as yours, allows us to support the 2020 Vision Quest mission of inspiring people to reach beyond adversity and achieve their highest goals. Through 9 years of Peak Potential, the team has been able to grow a strong community to provide incredible support, and it is with the help of Bank of New Hampshire, we continue to do so into 2018. I’m also pleased to announce that I’ve joined Randy and the team in helping coordinate sponsorships for Peak Potential 2018 so we can make it the best year yet. 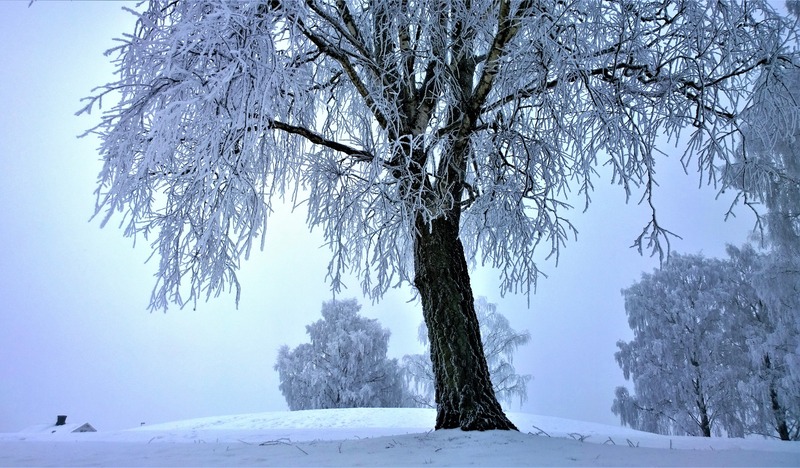 As a lawyer and small business owner, I bring a different viewpoint as to what might intrigue other business owners to sponsor and support Peak Potential. I’m excited to have the opportunity to help Randy and 2020 Vision Quest promote Peak Potential, which I was able to attend last year. It was truly an inspirational evening full of laughter and fun! I’m excited to see what we make of it this year and again have another wonderful evening. Tags: 2020VQ, Fundraising, Peak Potential, Randy, Support. Hopefully, Jose is guiding me to a fourth consecutive Boston Marathon success for April 16, 2018 even as we are announcing some exciting new twists to enhance the success you help us achieve with our Ninth Annual Peak Potential Dinner and Auction Gala. Save the Date: November 17, 2018 at 6:00 p.m.
Tickets will officially go on sale June 1 and we encourage you to begin organizing your tables early. For the first time, we are inviting you, our generous supporters, to pick your table location. All of the normal on-line sign-up will still be in place, and we’ll reach out to table purchasers in the order that the payment is received with the layout of the available tables, allowing you to select where you and your fellow supports will enjoy a great meal and event festivities. We are also keeping our early purchase pricing in place at the same $500 for a table of 8. There is also a limited number of larger tables for those of you whose group is 10 or 12, available on a first come, first served basis. So start your table coordination now and be among the first tables booked to use our new location selection feature! As always, we understand how fortunate we have been for the incredible support of our community. We continue to work hard to ensure our mission and effort are always worthy of your support. This year we believe we’ll be delivering a few additional surprises to take this event and our appreciation of you to the highest peak yet. We hope to see you in November. Please help us to spread the word! Autumn hopes you’ll join us! Tags: 2020VQ, Inspiration, Outreach, Support. I believe that you achieve vision not from sight, but from viewing the world mindfully. 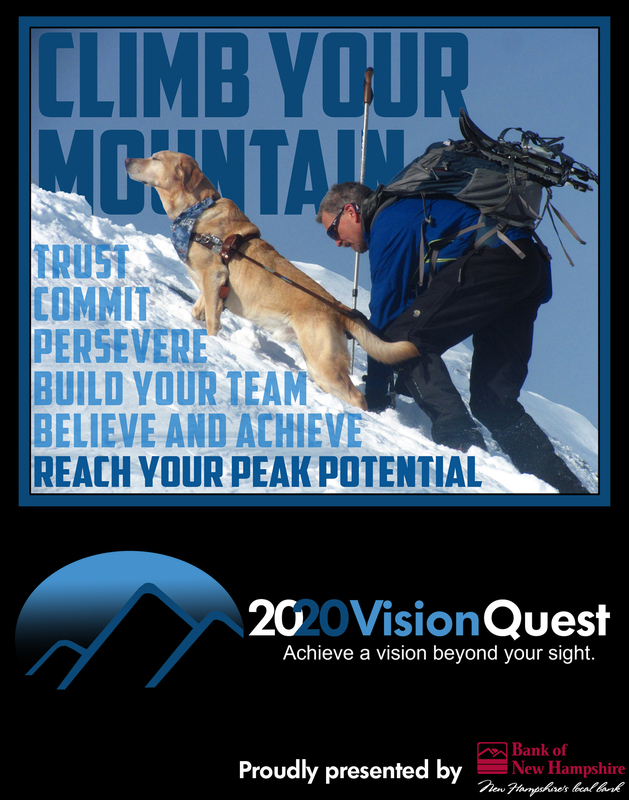 Our 2020 Vision Quest team strives diligently to serve our collective vision to our best ability, or as we prefer to phrase it: peak potential! One way we achieve this is through an open-minded view of all the opportunities the world presents to us. 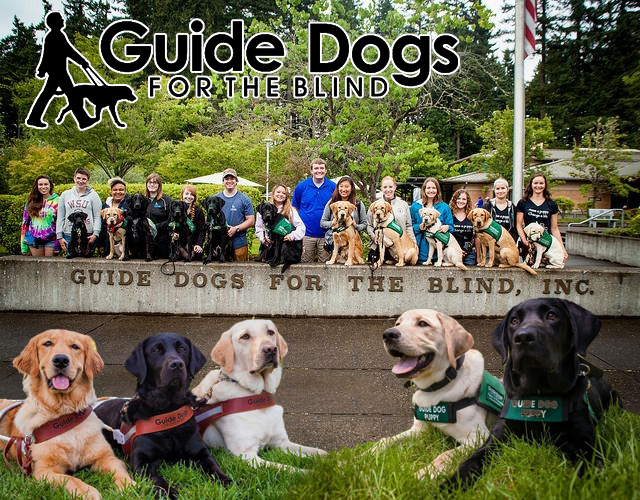 As such, we recently did a thorough exploration of new opportunities and found to our overwhelming appreciation an obvious and worthy one to share: We are excited to announce a new partnership with Guide Dogs for the Blind. 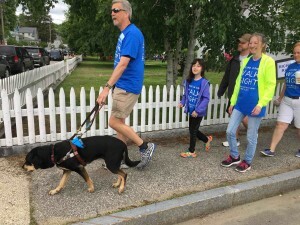 Guide Dogs for the Blind is more than an industry-leading guide dog school; they are a passionate community that serves the visually impaired. 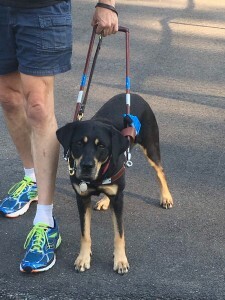 With exceptional client services and a robust network of trainers, puppy raisers, donors, and volunteers, they prepare highly qualified guide dogs to serve and empower individuals who are blind or have low vision. We were impressed to learn Guide Dogs for the Blind produces roughly twice as many working teams each year than other US schools. They also have an enviable financial efficiency, with an average cost per team that lower than most if not all other schools, making them an excellent value for our donation. All their services are provided free of charge and they receive no government funding. GDB is headquartered in San Rafael, California, with a second campus in Boring, Oregon. Since their founding in 1942, they have graduated more than 14,000 guide teams; today there are approximately 2,200 active teams in the field across North America. 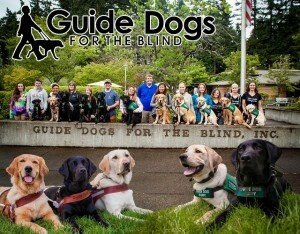 For more information, please visit guidedogs.com. 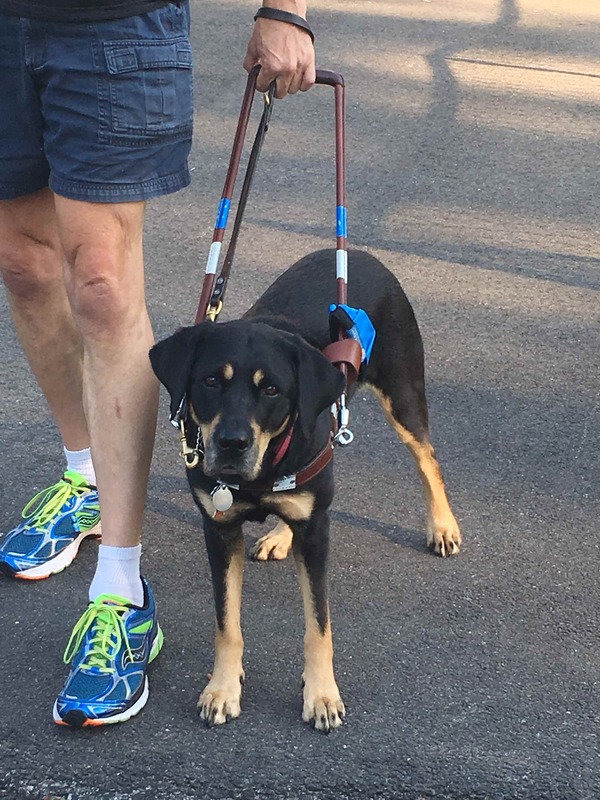 We will continue to equally split our charitable donations between two outstanding vision assistance organizations — Future In Sight and Guide Dogs for the Blind — with full confidence that we are conscientiously serving our mission. With this announcement, we will have a cross-country partnership with a team eager to work with us on our shared vision. This is also a reunion with the school from which I received my very first Guide Dog, Ostend — but don’t worry, Autumn and I are doing fine. She is healthy, happy, and working very well with me. I expect that she and I will continue our successful work together for many years ahead. We are excited for our new partnership and the increased impact that our support will achieve. We think you will find many reasons to appreciate their work and find them deserving of our support. Please join me in celebrating the inclusion of Guide Dogs for the Blind in the mission of 2020 Vision Quest! Tags: 2020VQ, community, Fundraising, Inspiration, Outreach, Randy, Support. 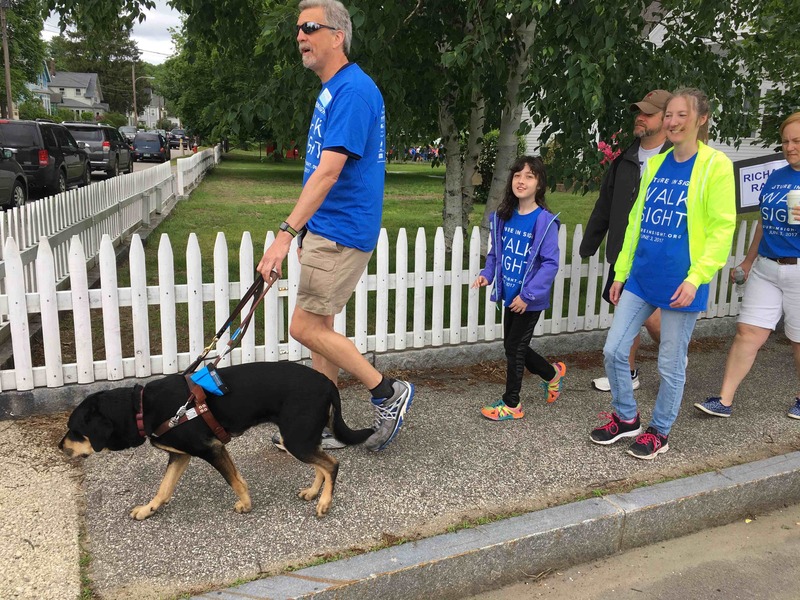 Randy and Alex, the 2017 team captain, in the Walk for Sight in June 2017. Look out for Tracy as the team captain for 2018! 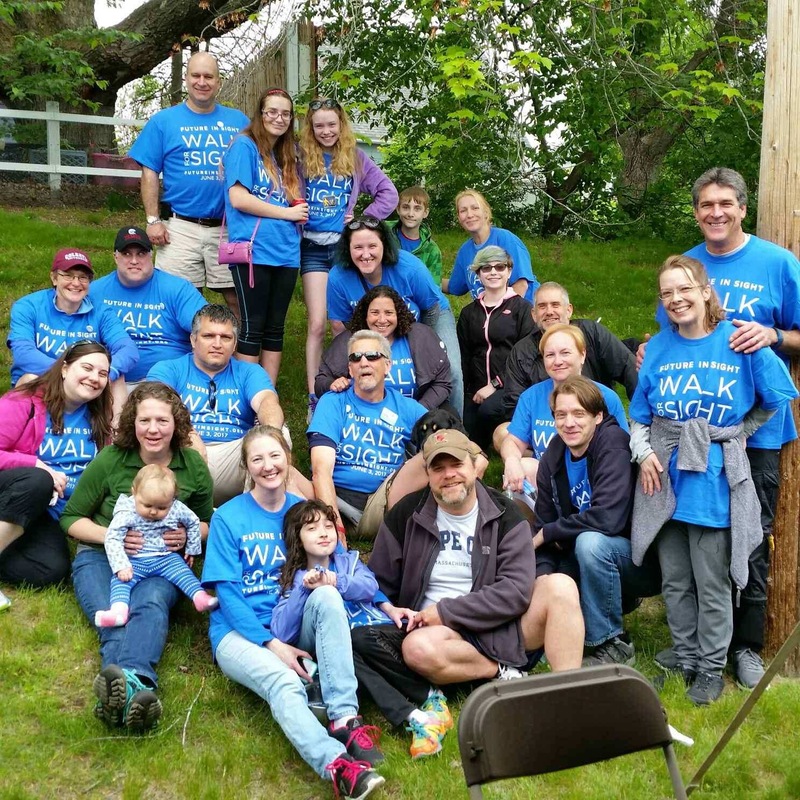 On Saturday, June 2, 2018, I will celebrate walking at the 15th Annual Walk for Sight at 25 Walker Street, Concord, NH which is the home of Future In Sight. I will celebrate the thousands of lives uplifted by their life-changing training, services, and support — including my own! What I hope to celebrate even more is the many people who will gather to walk the 3-kilometer route or otherwise support our ability to ensure thousands more in need will have the same opportunity. We can raise awareness, funds, and community connections by joining together to enjoy the late morning and early afternoon. We have had so many commitments and activities for ourselves and our many friends that it has been more challenging to sustain our commitment to this wonderful event for the incredible 15 years. Yet the need persists and the organization’s commitment to improve it each year while elevating the incredible work they achieve has enhanced their worthiness for our efforts. The 2020 Vision Quest team at Walk for Sight 2017! So Autumn and I implore you to consider joining our team and using the new website to help reach out for donations to support the 2020 Vision Quest effort as well as Future In Sight. We will be splitting our fundraising in a 50/50 program, assuming we meet our minimum fundraising requirements of $1,000 as a team. We have managed this each year since the program began and I can tell you that Autumn and I have made that amount our personal goal. If you cannot join our team — which is our absolute first preference — then please consider making a donation to our effort. Donate to Randy and Autumn’s Walk Page! The earlier you make the choice to join the team, the easier it will be to hopefully help raise a few sponsorships for your walking or general donations of support. So please consider one of my personal quotations: procrastinate procrastination! Join us today and we’ll keep you informed of all the ways we hope to keep the event and our team growing together towards our goals! Tags: challenges, community, Inspiration, Randy, Support. 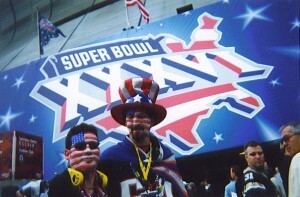 Almost everyone I knew and never knew was eager to give me encouragement and congratulations, excited and enthused for my unusual experience as not only the Patriot Fan of the Year but unimaginably announced as a selection for the Ultimate Fan with a plaque to be placed in the Pro-Football Hall of Fame in Canton, Ohio. For me, the much supported excitement was entirely focused upon the upcoming Super Bowl competition between the St. Louis Rams (“The Greatest Show on Turf”) and “my” New England Patriots. I’d recently had a fun on-air radio interview with Emmitt Smith of the Dallas Cowboys who, while congratulating me and my team, hoped I was content because we unfortunately had no chance in the game. It is with that perspective I always hope to readily find the appropriate respect and humility to appreciate accomplishment without ever denigrating a challenge. It is also where I put my experiential philosophies to the debate as we went point for point on why I thought there was always reason for hope with a plan and the determination to back it up. Why I felt that teamwork raised the group beyond the individual limitations when managed effectively. I still recall his final dismissal: “You are a great fan and I respect that, but I’m an NFL player and I think I’ve got a little more credibility — Rams will win.” Undaunted by his unquestioned talent and great humor throughout our work I responded: “Emmitt, I’m already in the Hall of Fame and you still have to wait five years so maybe I have the credibility edge and I still say my team has a chance in this game!” He laughed himself off his chair, conceded the jab if not the game, and we shook hands in appreciation of a fun interview and time well spent. While the eventual Patriot victory served my point rather well that day, the real points for me are methods of approaching life. There is always possibility if you are willing to problem solve and persevere. It is always reasonable to maintain an appropriate respect for opposition and humility for our own abilities both to succeed or stumble. 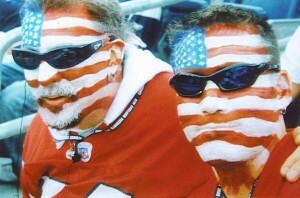 I have long loved the sport of football and specifically my New England Patriots. I love the blend of strategy with a myriad and diverse style of athleticism into a team oriented effort. I love the social interactions which are readily encouraged by the stop action nature of the sport as personnel shifts and formations allow for strategy discussion before the flurry of action. I spent decades attending every home game and wearing my fanaticism plainly with the reward of so many moments of friendship and fun along the way. I still love my team today and will be hoping and rooting for their win on February 4, 2018. I know they have been winning at levels so far beyond what I could have ever expected and more than any fan surely deserves. I truly wish the positive fans of every team could understand and experience some of the great rewards I believe my team has brought to me. Of course I want my team to continue to strive for excellence and to win. I candidly miss the long gone days when so many were eager to be positive and encouraging for me and my team as well. The reality is that resentment for our team has grown for a variety of reasons. Some of those reasons may be deserved, many are less so. I too feel concern for how the NFL manages player safety, domestic violence, and a monetary foundation which seems to have lost more focus than I find comfortable. I watch the opportunities for real and positive change to come along and advocate for it in the ways I am best able. Much as I did with Emmitt so long ago, I believe it’s possible and for now continue to enjoy how fortunate I am to enjoy a remarkable team on an incredible run. I recall some of the lessons I learned from this team and how, with a little thought, they might apply to life and hope for those positive aspects to find their way to the forefront again. Tags: Hiking, Inspiration, Motivation, outdoors, Randy, success, Support. As many of you know I’ve been working on my own book project for longer than I’d like to admit. It is going acceptably well at this point after a series of unreasonable delays which have disappointed me and frustrated me at various times. A friend of mine shared with me words from Stephen King suggesting that if you truly want to write, nothing will stop you. I met Matt Landry indirectly as a result of our mutual appreciation of hiking. We crossed paths a few times including a marvelous afternoon last summer. I’ve been a fan of his on social media as his kindness and wisdom shone very brightly. Thus I was determined to read his newest book and share with all of you. What a delight I found in the journey he shares with us! It’s far more than a journey through the 48 although I did some reminiscing of my own hikes while reading. It’s a journey of goal setting and moving our life forward, upward and onward. I strongly encourage you to pick up a copy of his book and remember if you use 2020 Vision Quest for Amazon Smiles you help us along the way. In the meanwhile, here are five simple questions and much better answers from the author, Matt Landry. 1) This isn’t your first book and the choice to become a writer has come later in your life. What inspired you to publish initially and what was the motivation behind writing this book? To make a long story short, my main goal in life is to make the lives of others easier. About 3 or 4 years ago I decided to go back to college to work towards my Human Services degree. In doing so, I took an English composition course, and with the encouragement of the professor, I decided to write a book. She saw a value in the way I wrote that I couldn’t see in myself. Writing a book was an excellent vehicle for serving my purpose of changing the world for the better. The motivation behind the initial book “Learning to Be Human Again,” my first, was that it was drawn upon from a series of journals I had written about ten years ago while going through a major depression. One of the biggest lessons I learned was to in order increase my self-worth and limit my regret was to learn to simply be myself. The true “me” that was created to shine in only the way I knew best how to do before the World told me who I thought I should be. I thought others may have benefited from a book like that. 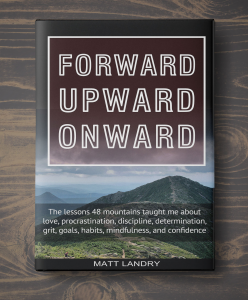 For the current book “Forward, Upward, Onward,” the motivation came more from just wanting to achieve a major goal and to see what I was made of, and again, maybe helping someone else do the same in the process. I had a lot of fun writing this one, and hopefully, it shows. It was good to re-live a lot of these hikes again while I was organizing and writing the book. 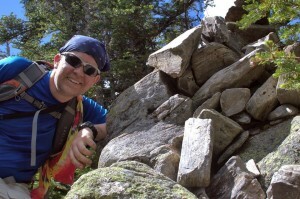 Matt Landry on a hike on Mt. Willey. That quote has to do with a mindset and lifestyle that I lived with for most of my life, and I feel I’m not alone in that concept. The example I used in the book was that if you buy a book about how to speak Italian, it still doesn’t allow you to speak Italian unless you open it up and read it and practice the information inside. The same goes for music lessons. How many of us have bought a guitar, then let it sit without picking it up, then wonder why we can’t play it? Another great example that ties in well with this New Year is a gym membership. How many of us pay a monthly fee, and don’t go, but having a membership makes us somehow feel like we do? Or that paying monthly will somehow alone make us magically physically fit? Having the mindset of the completion of a goal in your head is crucial. You need to believe and imagine you are running the marathon, passing the course, making the money, or climbing the mountain before you even step out the door. The problem I had was the walking out the door part. I had imagined the goal of hiking the 48-four-thousand-footers having been completed so much and so vividly, I was almost convinced that I had. The problem was that I actually needed to climb them in order to say I had. It’s no different than losing weight, quitting drinking, starting a new career, or, well, writing a book. There comes a point when you need to stop talking and you need to do the work. I had that epiphany during my 48 peaks goal, and it made all the difference in the long run. Stop waiting for tomorrow, stop talking about it, and stop dreaming. Do the work. 3) You share many appreciative points of kindness in your book, including some sent in my direction–thank you for that. I’m curious what was one of your favorite responses you’ve received from those of us who are so appreciative at your choice to share so much of yourself and your insights with us in your books? Is there a favorite comment, letter or expression of appreciation you’ve received which you can in some part share along with why it has such meaning for you? With all due respect, the kind words said to me by friends about the books or my insights mean the world to me, but it’s the strangers, the people who I have never met, that mean a little more to me. Although the encouragement of people I know is an important part of my getting these books done, it’s the connection of making a difference to those who I don’t know that goes a long way in motivating me. Back to the question you asked, I have no specific notes of importance that outweigh another, but I’ve been blessed to get enough of them to help me realize that I’m on the right path right now in what I’m doing. Encouragement of any kind is always a great fuel, isn’t it? 4) While we are on superlatives, you cover many high points and low points of your journey in the book so I’ll leave those there. I’m curious if you have a high point to share in the writing process for either of your books? In writing, I go with an almost fits and starts method. I will say that a high point in any writing project, especially a longer one, is the final edit. In my case, being a new writer, I also found another surprising high point was getting your book back from the editor and reading through it, to see how they were able to make it flow better. A good editor can make your words truly come to life. That was a surprising aspect of this writing journey I’ve been on. I thank goodness I didn’t release anything that someone wasn’t able to take a good hard look at first before I put it out there. You get so encapsulated in what you’re writing sometimes that you lose the forest for the trees about the story or concept of the book that you’re trying to convey. It’s nice to have that second set of eyes to set you straight or to let you know that you’re in the right direction! Hiring an editor alone was one of the smartest things I may have done in writing a book. I learned more about my writing in general than any classroom could have taught me. I originally thought I was hiring an editor, what I didn’t know is that I was really hiring a teacher! 5) Any thoughts on what we might expect next in your writing world? I currently have three projects in the works. My next will be a “Landscape Photography for Beginners” due out early February. In late April I have “Learning to Be Happy Again,” which is a series of 25 tips, habits, and tricks to live a happier life every day. And finally, I have a book based on my travels and lessons learned in the southwestern United States years ago due out at the end of the summer of 2018. Tags: 2020VQ, community, Outreach, Randy, Support. I always strive to connect with people. It is perhaps one of the foundations of who I am and not surprisingly how I have been able to achieve. It is why Celeste’s kind words above inspired me. Through the evolution of 2020 Vision Quest, my keynote presentations to corporations and other organizations have developed into a fundamental part of our connection and the means by which we raise funds to do our charitable work. I appreciate the outstanding and often longstanding ovations received for the method and message in our keynote approach. I intend to keep building on the worthiness and expanding our outreach. Anyone may schedule a presentation or learn more on our Keynote Presentation page. What is the goal of my keynote presentation? While my experiences have equipped me with a foundation of prominent speaking points such as goal setting, managing adversity, teamwork, communication, managing failure, finding purpose, motivation, and more; the essence of them is my ability to customize each presentation towards the target audience. The presentation has a highly relational conversational tone which most who attend find captivates their attention and broadens their vision. In order to do this, I typically will take the time to understand the objectives of the conference, meeting, or event to ensure the right anecdotes and themes are brought to the forefront. I encourage a positivity which is well grounded in understanding and embracing realistic challenges in a resilient, problem-solving mindset utilizing collaboration and communication to best affect. These successful keynotes have enabled us to present across the country to hundreds of organizations. Whether a small business group or full corporate event, the testimonials continue to confirm that we meet and more often exceed the objectives professionally while providing an uplifting personal inspiration for those who join us. As compensation for these keynote presentation, we request an honorarium to the 501(c)(3) charity, 2020 Vision Quest. With all the positive aspects involved in this opportunity, we again encourage you to consider scheduling us for your event or recommending us to someone you know in need of such a speaker for their event. We think you’ll join many people who believe it was one of the best decisions they made. Schedule a presentation or learn more. Tags: community, Outreach, Peak Potential, Randy, Support, winter. I’m all too often aware of the many worthy causes which tug on all of our heart strings as we travel the paths along our journey. Sometimes the causes fill me with sadness and the empty feeling of being insufficiently able to help. Usually though, the very act of learning is because someone has guided me to the opportunity. It was the night before our Peak Potential event as we were closing out preparations when two inspiring people made the first choice. Tom Cassetty is a friend who also coaches young athletes in running. That morning, the father of one of his young runners had unexpectedly died. We all scramble for how to respond in such dour times laced with well intentioned platitudes. Tom wanted to ensure the runners for the track meet the next mourning would have black arm bands to wear to memorialize the father and he needed someone who could sew them together for him late that night. My wife Tracy immediately volunteered and together they made it happen despite all the many reasons she could have understandably elected not to step forward. I am so proud and appreciative of the kindness and caring in these two people for a simple step and still I felt and feel so concerned at the wife and eight children left behind by the sudden death of John Balletto. John was their source of income through his business of moving and clean-out services Balletto & Sons in Hudson, NH. His wife Melanie intends to temporarily close the business to prepare for her ability to take over managing it going forward. Those changes will take a little bit of time and I hope that anyone in need of their services will consider reaching out to them as they re-open. In the meantime, the holidays approach with many needs despite many caring people reaching out to help with their short term needs and if you, like me, are moved to help in any fashion; I wanted you to have access to their story and a place where you could donate. Tags: 2020VQ, community, Fundraising, guest blogger, Inspiration, Outreach, Randy, success, Support. Carolina with her table having fun at Peak Potential 2017! Be the main character in your life, and the supporting character for others, especially in those lives of the people you hold dear. When Randy asked me a few days ago if I wanted to write the guest blog about his foundation’s main event, Peak Potential, I was thrilled. When I realized that he asked me because of a conversation we had had months ago – marathons ago, difficult times ago, ages ago – I was honored. I have never heard an unkind word spoken about Randy or Tracy – in fact, everyone always says they are both inspirational, awe-inspiring, amazing. That’s all true, and last night’s event was a complete testament to that. But that wasn’t my take away from last night’s dinner and fundraiser. I arrived fashionably early last night, and was immediately greeted by Tracy, Randy’s beautiful and also inspiring wife. Tracy isn’t just the woman behind the man – she takes on her own challenges – school while working full time, running, etc – and handles them with grace and sometimes, I’m sure, a few choice words, but nonetheless she handles them! I was handed my name tag, given a few details about the night, and directed to the room where the silent auction items were laid out. There were people milling about looking at items, but what struck me was the team that was still working diligently to take care of those last few details to make sure the event went smoothly. As my friends arrived, we drank, ate and chatted. And that’s the second time I was awe-struck again. I was surrounded by friends – amazing people who were doing amazing things, some small, some large – none more amazing than the next and everyone had chosen to spend an evening in support of our friend, Randy, because of what he meant to us. The items for the silent auction were plentiful and amazing – from jewelry, to weekend stays at a ski resort, to a beautiful, handmade afghan blanket made by Randy’s mother (probably the most valuable item in that room). It was wonderful to see how many different people and organizations had come together to donate items to support 2020 Vision Quest. We were slowly ushered into the dining room, where dinner was served. The food was delicious and the atmosphere lively – somehow you felt and knew that Randy and Tracy, and their friends, had orchestrated every last detail so that we would all have an amazing evening (although I must admit, the coffee was lacking in quality, but I’ll let it slide). The Live Auction was next and brought laughter, bribery with puppies, bidding wars, and an extraordinary amount of money raised for the charity! And apparently someone is being fed homemade scones by Randy while riding in a hot air balloon – I’ll let you decide if that’s a prize or not. Then, Randy spoke. 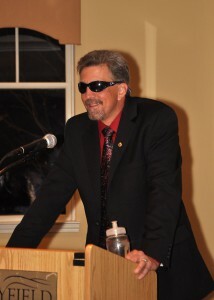 I don’t want to say he gave a presentation – he does that almost every day to various schools and organizations. Nope, last night, Randy spoke. He spoke to a room full of friends, family, supporters – he spoke to his team – the people he has in his life who help him get through the big challenges, the daily struggles, the happy times and sad days. Randy spoke about being the main character in your life story – making the choices that allow you to be the best person you can be, to reach your Peak Potential. No matter who you are, you need to surround yourself with a team of people who will help you, guide you, catch you when you fall, laugh with you, and love you. Randy spoke about building that team so that you could be the main character in your life story, not just a backseat driver. And I’ll take it one step further: on top of being the main character in your own life story, be a supporting role for others, particularly those people that you hold dear. Life is too short to live it in solitude, thinking you can achieve your goals alone. Besides, when you get to the top of the mountain, you want someone there to share in the champagne, whiskey, coffee, and cake (okay, maybe not the coffee!). Guys, life is not easy, but it wasn’t meant to be. We all have our stories, our struggles, our journeys. I own my own business, have two small children, attempt to be a runner, and try to be there for my friends and family – the people I hold close. Because without those people, I wouldn’t be able to even THINK about achieving the goals I want to achieve. They believe in me, even when I do not. The final “event” of the night was a team/table event where people could make pledges towards 2020 Vision Quest. 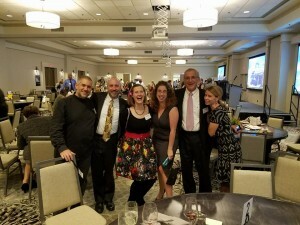 The team – everyone in the room – raised more than $13,000 in less than 10 minutes! That’s teamwork! At the end of the night, I grabbed one of the posters that was being handed out. I didn’t open it up until this morning, but when I did, I knew it was a poster that was going to be hanging in my kitchen so that I could see it every day, so that my kids could see it every day. It is the embodiment of what I want to teach my children – climb your mountain, reach your peak potential, and remember, you can’t do it alone – build your team and be there for the people who have chosen you to be on their team. Learn more about Carolina Tumminelli. Bad Behavior has blocked 158 access attempts in the last 7 days.